Wearing shoes can become a painful experience if you suffer from hammertoes. Luckily, your Danbury, New Milford and Plainville, CT, podiatrists, Drs. Joseph Treadwell, Christian Davis, and Rihamary Jimenez of Foot & Ankle Specialists of Connecticut offer treatments that can ease your pain. What can I do about my hammertoe? Hammertoe causes the joints of your second, third, fourth or fifth toes to bend. If you look at your toe from the side, you'll notice that it resembles a hammer. Like most health conditions, hammertoes are easier to treat when you first notice the symptoms. 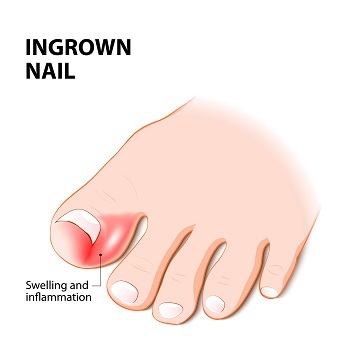 Initially, you may be able to straighten your toe momentarily by pressing on it. If you don't receive treatment, the toe may become rigid and inflexible. Visit the Shoe Store: The shoes you usually wear may press on your hammertoe, increasing pain and causing the formation of corns and calluses. Replacing your usual shoes with roomier footwear is a good idea if you have a hammertoe. Look for shoes that offer high, roomy toe boxes that don't press on your hammertoe. Give Your Toe a Workout: A few simple exercises may prevent your toe from becoming rigid. Try scrunching a towel with your toes or attempt to pick up marbles with your toes. Add a Little Cushioning: Reduce pain and pressure on your toe by applying corn and callus pads. Reduce Corns and Calluses: Use a pumice stone to gradually remove layers of hardened skin. Don't attempt to treat corns and calluses at home if you have diabetes, as home treatment could increase your risk of an infection. See Your Danbury, New Milford, or Plainville, CT, Foot Doctor: Your foot doctor offers a variety of treatments that can improve your comfort, including splints that help realign your toe and prescription orthotics that control muscle and tendon imbalances. If your pain doesn't get better after using over-the-counter medication, your podiatrist may recommend a corticosteroid injection. Surgery may be the best option if your toe is painful or rigid. Don't let your hammertoe disrupt your life. Schedule an appointment with podiatrists Drs. Joseph Treadwell, Christian Davis, and Rihamary Jimenez of Foot & Ankle Specialists of Connecticut by calling (203) 748-2220 for the Danbury, CT, office, (860) 355-3139 for the New Milford office, or (860) 747-2200 for the Plainville office.